Since its launch in 2013, this initiative has provided assistance to around 200 patients, performing more than 700 tests and 130 surgical procedures as well as providing medical treatment and optical correction when required. The difficulties accessing surgery for cataracts or retinal diseases - the cases seen most often in the programme - does not only lead to a significant loss of vision in affected people but also to their ability to live independently and overcome adversity. For this reason, and based on experience from the testimonies from the project, being involved differentiates the before and after in their lives; an alternative to a tunnel with no end in sight. Operation Vision doesn't just include the surgical procedure itself but the entire treatment process for these patients including the visit and diagnostic tests as well as post-operative follow-up and the medical discharge report, Therefore, the Institute of Ocular Microsurgery dedicates the experience and knowledge of its professionals, as well as facilities equipped with the latest technological equipment to offer specialised and high-quality care. Who can be included in the programme? Estar en una situación de precariedad económica. Sufrir una patología ocular que requiera atención de urgencia, algo que será valorado por el comité médico de expertos de IMO. Be in a precarious economic situation. Suffer from an ocular pathology requiring emergency care, something which will be assessed by the IMO's expert medical committee. Although Operation Vision was initially planned as a one-year project in Catalunya, it has grown thanks to the involvement of professionals from the IMO Foundation and contributions from entities and individuals involved in ocular health. 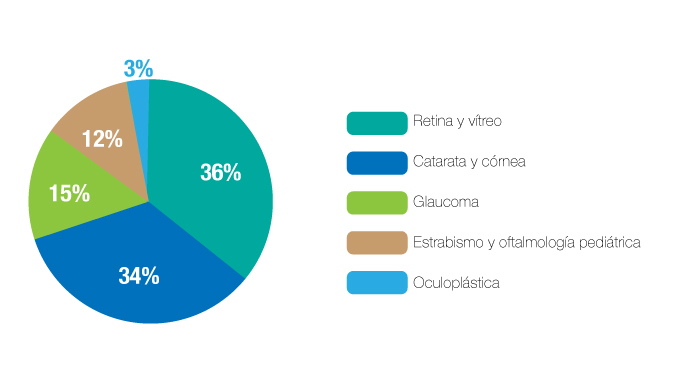 Therefore, after extending it and expanding it to the whole of Spain in 2014, the initiative is still going in 2016 and, with the aim of making it sustainable, is focused on offering care for eye health emergencies to the most disadvantaged groups. In 2015, the scale of the Operation Vision programme increased considerably thanks to which 108 basic visits and 144 follow-up visits were carried out (approximately double compared with the previous year). The tests most commonly requested during these check-ups - to confirm the pathology diagnosis or to assess its evolution - were optical coherence tomography (OCT), used to view the different layers of the retina (63 tests); retinography, consisting of a colour photograph of this tissue (52 tests); and campimetry, used to assess the patient's field of vision (25 tests). In terms of the surgical procedures carried out as part of Operation Vision, more than 1 in 4 were cataracts operations (phacoemulsification with the implant of an intraocular lens), the most common pathology within the programme and the leading cause of blindness in the world. Another common procedure, with 12 operations in 2015, was vitrectomy, a technique used to treat different retinal diseases such as retinal detachment, macular hole or diabetic retinopathy, among others.